First, here’s a recent video made in January, ’18 by Nick Capodice, of New Hampshire Public Radio to get you in the spirit. And, here’s a program by Nina Totenberg, of NPR, about a program for HS students that Mary Beth was involved with in Washington DC in December, 2017. Here’s the Washington Post article from the same event. These will give you the idea of what Mary Beth is doing today. When and where did you wear an armband to school? December 16, 1965. I was in 8th grade at Harding Jr. High School, in Des Moines, Iowa. Why did you wear the armbands? So much was going on, like now. For myself, I was more and more upset and sad about the Vietnam war, as I heard about it from my parents and watched it on the news. On TV, as we got ready for dinner every day, we saw pictures of the war, including soldiers in “body bags” and Vietnamese kids running, screaming, from their burning huts. So, we wore the armbands to mourn the dead on both sides of the Vietnam war and to support a Christmas truce that was being called for by Senator Robert Kennedy. Also, since it was Christmas time, with the usual messages of Christmas filling our house and community- peace, love, brotherhood- the lessons of all faiths. My dad would light the yule candles and pray to us from the bible about these message of Christmas, of hope, love and forgiveness. But on TV, we didn’t see love or forgiveness- just killing. 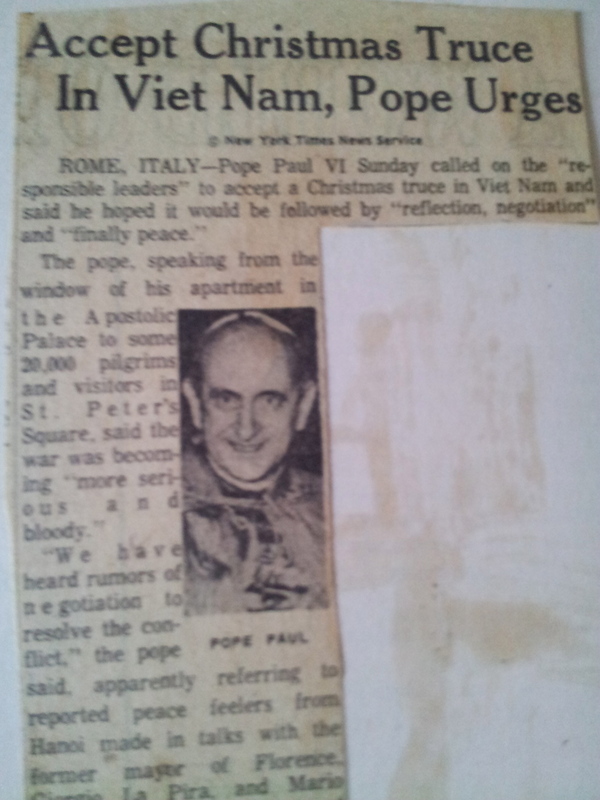 The Pope was also calling for a truce that Christmas. On December 16, 1965 Chris Eckhardt, Bruce Clark and Chris Singer, wore them to Roosevelt HS. My brother, John, to North HS, the next day, on December 17th. On December 14th, Perry Hutchison at Lincoln HS in Des Moines, but he wasn’t suspended. Other students who wore armbands but weren’t suspended were my younger sister, Hope, in 5th grade at Madison school in Des Moines, and my brother, Paul, in second grade at Cattell school in Des Moines. They didn’t get in trouble because there was no rule against elementary students wearing armbands. In fact, at recess Hope’s teacher stood up for her, saying that we have a First Amendment in our country. I’m really excited that Hope, Paul and I will be speak with 5th graders at their schools this December. How old was your brother, John, and Chris Eckhardt? Did you already know Chris Eckhardt? A little, but he went to a different school and he was older. My parents and his parents were friends, though, because we were all involved in peace issues already. 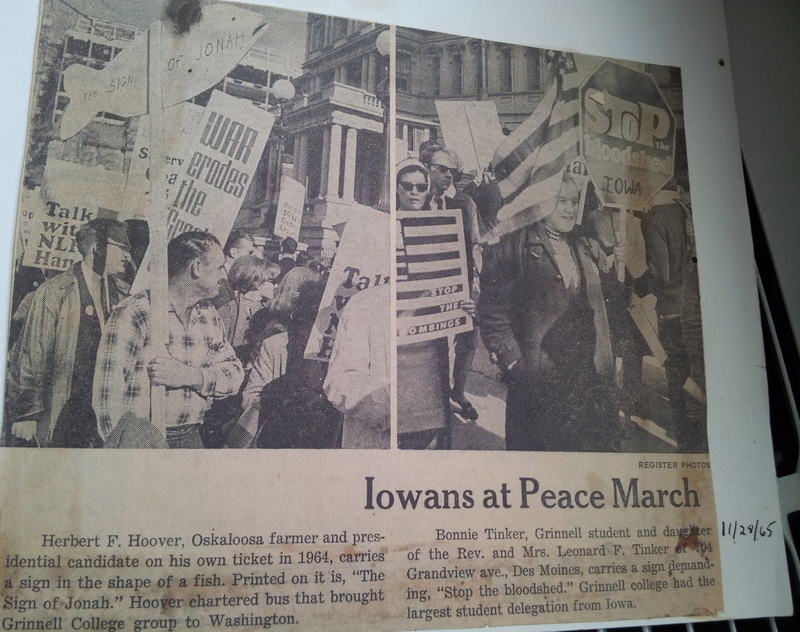 There was a group called “Iowans for Peace” that I think my parents and also the Eckhardts were involved in. How did you get the idea to wear the armbands? Some Iowans attended the first national anti-Vietnam war rally in Washington DC in November, 1965, including my brother, John, my mother, our friend Chris Eckhardt, his mother and my older sister, Bonnie. Back in Des Moines, some of the people who had gone met to discuss what could be done to support peace in Vietnam, particularly a Christmas truce that had been proposed by the North Vietnamese and was being advocated by Sen. Robert Kennedy. The meeting was at the Eckhardt’s, and some say that a Quaker named Herbert Hoover (distant cousin of President Hooover), who had helped organize the trip to DC, suggested black armbands. At first, the idea was for college students and adults to wear the armbands, starting Dec. 16th, through the holiday season, and to fast. The next night, there was a meeting of the Unitarian youth group, Liberal Religious Youth. Some members were Quakers, and John and I had attended at times. The idea of wearing black armbands to school came up there, since Bruce Clark (a student at Roosevelt who was eventually suspended) was there, and had heard about the meeting the night before from his brother. After a discussion, LRY decided to leave it up to each member whether or not to wear armbands. So, that’s how it all got started. My mother was quite an archivist, and you can check out her notes about these events, on John’s news website, schema-root.org. What I have said is from my memory and her notes. The idea of wearing black armbands to mourn the dead goes way back in history. The families of soldiers and others would wear them if their family member got killed or died. Black armbands had also been worn in Des Moines at a memorial service in September, 1963 to mourn the four girls killed in the Birmingham bombing. Some of us had attended, and Bill Eckhardt (Chris’ father) wore an armband. What did the armband represent? At the time, the armband represented a wish for peace, with two specific messages: 1) To mourn the dead on both sides of the Vietnam war, and 2) to support a Christmas truce that had been proposed by Senator Robert Kennedy. The black armbands still represent a desire for peace, but now they’ve also come to represent the desire by young people to have their voices heard and their First Amendment rights respected. Were you interested in civil rights before the armband controversy started? Yes, because of my parent’s belief in how to act out their Christian faith, we had been involved in racial justice efforts that were building up in Iowa at that time. We would picket with my mom at the Katz drug store that didn’t hire “negroes,” and in 5th grade I did a report for school on a book that really influenced me, “100 Years of Lynchings.” Around that time, my older sister, Bonnie, won a national essay contest for the NAACP for her essay on “What the Emancipation Proclamatin Means To Me,” and my family also won the NAACP “Iowa Family of the Year” award in 1963 because of our involvement in civil rights. In 1957, my dad had been removed from his church in Atlantic, Iowa, for his stand against segregation at the local swimming pool. In fact, that’s was why we moved to Des Moines just before I started kindergarten. So, we had lots of examples from the civil rights movement of how to take a stand. 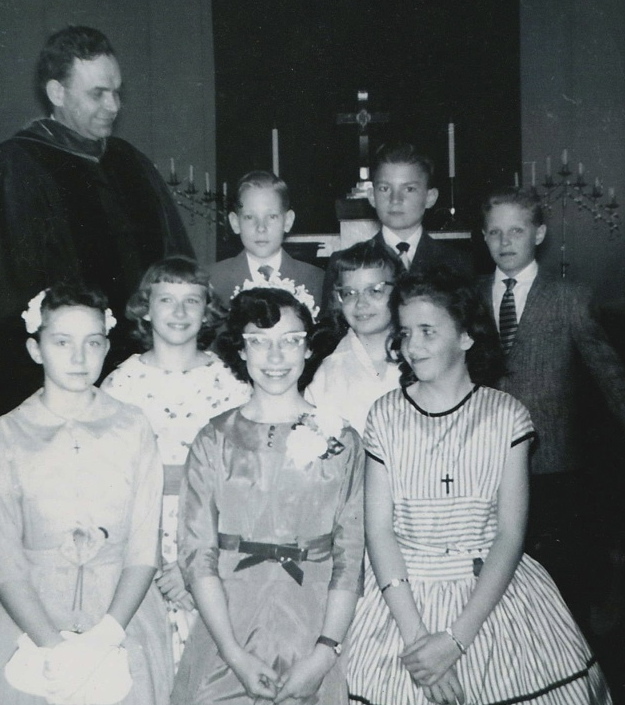 Were you influenced by your parents’ religious beliefs? Yes, my father was a Methodist minister, and my mother was also very religious, and had been active with the Methodists since childhood. When they got involved with the Quakers, who are all about peace, in 1963, that had a big influence as well. My parents were part of the “social gospel” movement, where people of faith believe that their views should be put into action. A number of our friends were also Unitarians, and we attended the Unitarian church in Des Moines sometimes, too. Some of the students involved with the armband action were involved with their youth group, the Liberal Religious Youth (LRY) and it was important to John & me, too. Were your parents held responsible for you wearing the armband? Were they supportive of your opinions? 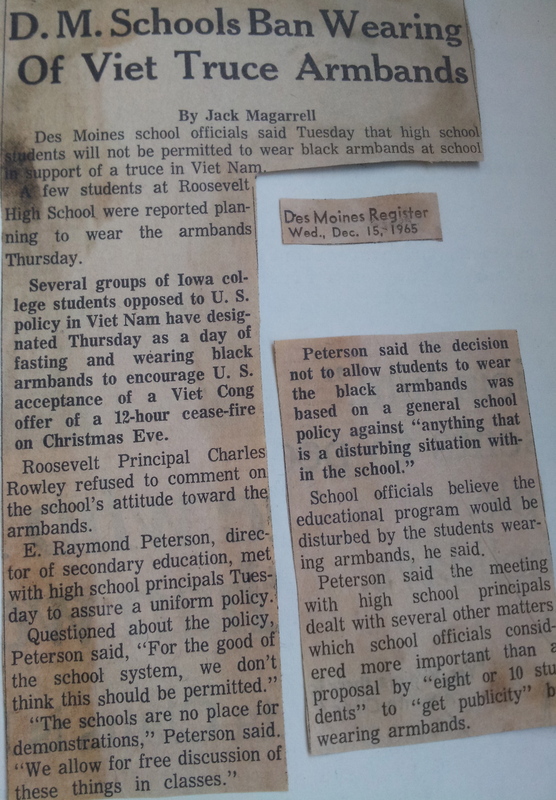 Yes, a lot of people, including the attorney for the Des Moines School Board, always implied that our parents manipulated us into wearing the armbands. That wasn’t true, and it wasn’t their idea. However, they did influence us to believe in peace, and to stand up for our beliefs. And, in the end, our parents did support us for wearing the armbands. At first, my dad didn’t think we should do it, but we convinced him that we were following our conscience, and after that he changed his mind. Why did your family change from being Methodists to Quakers? 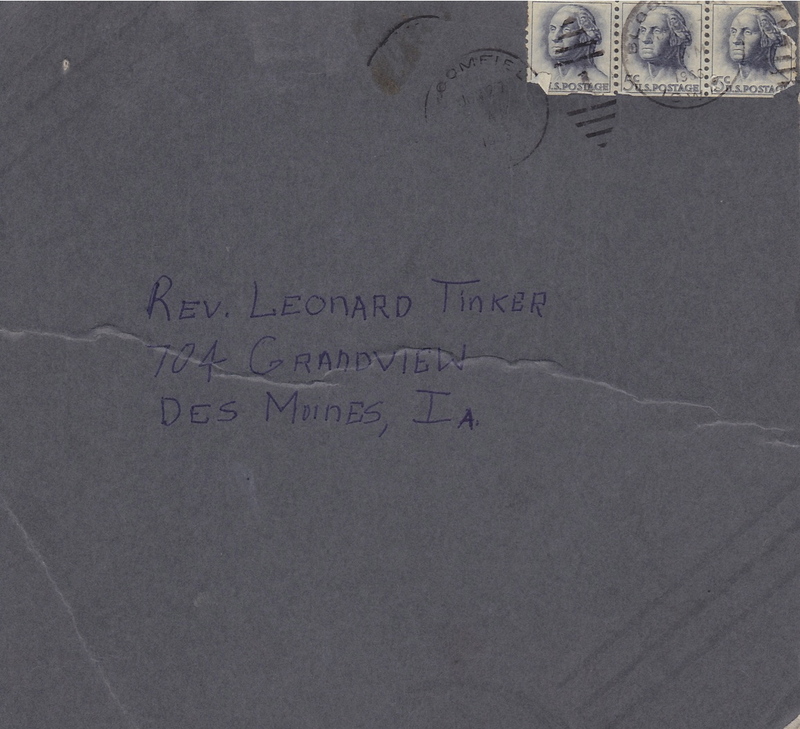 There had been controversy around my parents’ involvement in the civil rights movement, so my dad was pressured in 1962 to leave the church where he had been preaching in Des Moines, Epworth Methodist. He then went to work for the American Friends Service Committee (Quakers) and we started attending Quaker meeting. How did the principals hear about the plan to wear armbands? Ross Peterson was one of the students who planned the armband action. When he wrote an article about the plan for the Roosevelt HS newspaper, the principal saw his article and told the other principals and the superintendent, who then called a meeting. What did the administration do when they heard the plan? I think it was the Des Moines high school principals, and the superintendent, who had a secret meeting and passed a rule saying that anyone who wore an armband would be asked to take it off, and if the student didn’t take it off they’d be suspended. News of their rule came out in the Des Moines Register on December 15th, the day before we were planning to wear the armbands, which is how we found out. So, we knew there was a rule against armbands. How did you hear about the plan to wear the armbands? Bruce Clark and Ross Peterson, two of the students who were planning the armband action, came to our house to ask my dad his advice about what to do about the ban on armbands. They knew him from a summer teen peace camp that they had attended, which my dad had directed for the AFSC. When they came to our house that night, December 15th, my brother John and I also talked with them. I believe that my dad advised everyone not to wear the armbands. How did you feel about the idea of wearing the armband? I was nervous about it because I was shy and didn’t want to get into trouble. And, my dad had told us we shouldn’t do it because it was against the rules. But, in the end, I decided I should stand up and express my feelings about the war. How did your parents feel about you wearing armbands? My mother was understanding- she was also against the war. My father was against the war, but at first he didn’t think we should wear the armbands because it was against the rules. In the end, though, when John and I explained that it was our “conscience” that led us to want to wear them, that eventually convinced my dad that we should be allowed to. Did you know you would be suspended? We thought we might be. Did you know it was going to turn out to be such a big deal, with a big case? Absolutely no idea. That came as a big surprise, and still does. Since you knew it was against the rules and you might be suspended, why did you wear the armband to school? It was a combination of several things. One, I was very upset about the war, which was making me very sad. Two, I believed kids should have a right to express themselves. 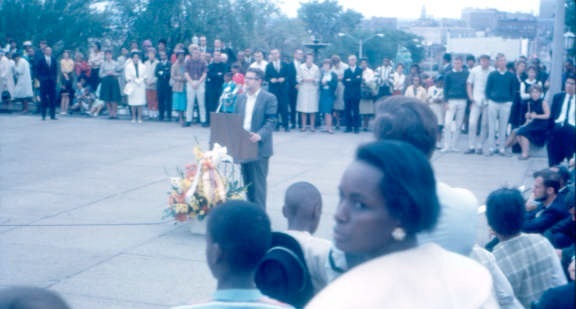 Three, I had examples of people who stand up for what they believe in, like my parents, Martin Luther King, and the kids who took part in the Birmingham Childrens’ crusade against segregation in 1963. We had seen those kids on TV. Even they were arrested, and attacked with dogs and fire hoses, they kept marching. So, I got the idea that sometimes you might get in trouble for peaceful protests, but that sometimes you should still do that. What did you originally do to protect your First Amendment rights? I guess the first thing we did to protect our rights was to use them, by wearing the armbands. What ethical issue did you face? The desire to follow the rules, since I was a “good” student and hadn’t been in trouble, contrasted with the desire to stand up for my beliefs, like peace. What happened when you got to school the day you wore the armband? I was really nervous and scared, but not much had happened in the morning classes, where people hadn’t really noticed the armband. I had gone to my home room class, home economics class (sewing) and, I think, social studies. At lunch, some boys at the next table over started teasing me, saying “I want an armband for Christmas,” but I ignored them. After lunch, when I got to my math class, I saw my favorite teacher, Mr. Moberly, waiting at the door with a pink slip in his hand, so I took it and went to the office. There, I was asked me to take off the armband. I was scared, so I took it off. I went back to my class, but then someone called me back to the office where Mrs. Tarman, the Girls’ Adviser, said I was going to be suspended anyway. I took my suspension paper and walked home. How did you friends and teachers treat you when you wore the armband? What happened to John when he wore the armband? John had decided to wait a day, until December 17th, to wear the armband because he wanted to try to change the ruling against armbands. So, someone called the School Board president on the 16th, but he said it wasn’t important enough of an issue for him to deal with right then. Because of that, John decided to go ahead and wear the armband the next day, putting on his only suit coat and the armband on the sleeve. The only problem was that noone noticed the armband because the armband blended in with his black suit coat. After lunch, wen he took off his suit jacket and wore the armband over his white shirt, a teacher sent him to the office. The principal treated John with respect, but he was suspended when he refused to take off the armband. What happened to Chris Eckhardt when he got to school with the armband? Did any of the others get in trouble? Bruce Clark and, I think, Ross Peterson were attacked by some students at lunchtime- I think it was off campus. What happened after you were all suspended? I don’t really remember what happened that night, except that there were a lot of people talking about what had happened, including Chris Eckhardt’s family, since he had been suspended as well. Some people gathered to talk about what to do. Someone called the superintendent, who said he didn’t have time to talk with us. That’s when John decided to wear an armband the next day. Some people were supportive, mostly in the Quaker, Unitarian, and peace communities. But it was pretty unpopular to say anything against the war at that time, and I’ve seen surveys showing that only about 15% of the U.S. population was against the war in 1965. So, some people got really mad. After you were suspended, did you go back to school? What was it like? Yes, I went back after Christmas vacation, in January, 1966. Things were pretty much the same as they had been before. I still went roller skating of Saturday nights with my friend, Connie. I still listened to a lot of music, worried about grades, clothes, what I was going to do on the weekend, whether I was fighting with my siblings, etc. All the usual things,but the war kept getting worse. Because we couldn’t wear armbands when we returned to school in December, we did wear all black clothes for the rest of the year. That was a change! Why did you take the case to court? My family and the Eckhardts took the case to court because we felt that kids have rights, like the right to speak up about things that are important to them. We wouldn’t have been able to afford the expense involved in a court case, a woman, Louise Noune (sp? ), who was a member of the Iowa Civil Liberties Union (ACLU) believed strongly that we had First Amendment rights and she urged the local chapter of the ACLU to help us with lawyers and legal services, which they did. How did your family pick the attorney? For almost 100 years, lawyers have been working and volunteering with the ACLU to help people defend their civil liberties. So, they picked the attorney. It was Craig Sawyer at first, and then Dan Johnston. We were very lucky to have great attorneys! Did you make money from the case? No, except for one dollar, which was a technical necessity in order to continue the case. How did it feel to be in court? It was scary and intimidating. First, we had to give depositions, which is where you go to an office and they interview you about what happened. Then, we went to the actual trial at the federal district court level, which was also scary. When we lost there, the case was appealed to the U.S. Court of Appeals for the 8th District in St. Louis. That Court covers Minnesota, Iowa, North Dakota, South Dakota, Nebraska, Missouri, and Arkansas. I don’t think we actually testified there, but we attended. I remember that it was the first time I flew in an airplane, and that I was worried about dressing right for it. How old were you when the case made it to the Supreme Court? I had just turned 16, I was a junior in HS and we had just moved to St. Louis from Des Moines. What was it like at the Supreme Court? When the case was at the Supreme Court, I was awed by the whole situation and mostly remember the Justices sitting in the front in their black robes. I had just moved to a new school in a new city (St. Louis) at the time and was in the middle of eleventh grade when we went to Washington to hear the case. So, it was a stressful time because I was adjusting to a new school, and new friends. So, I really don’t remember a lot about being in Washington. I have always felt honored that the Supreme Court heard our case, as they hear less than 1% of the cases appealed to them. What were you thinking during the trials? I was thinking that we probably wouldn’t win, and that it wasn’t fair. Also, the war kept going on, so I felt sad and thought about that a lot. As far as conversations during the trial, there were three: one at the district level, one at the appeals level and then the Supreme Court arguments. One thing that came out that was very significant, and I think this was at the Appeals level, was that the principals had allowed other students to wear symbols, like the Christian cross, and the Iron Cross of Germany, but they wouldn’t allow our symbolic speech (against the Vietnam war.) So that’s called “viewpoint discrimination” and it’s clearly unconstitutional. Where were you and how did you feel when you won the case? I was in eleventh grade at my new school, University City HS in St. Louis. I felt really happy and kind of surprised that important judges like those on the Supreme Court would rule in favor of kids, and say that kids have rights. At home, we celebrated with ice cream and soda, but I had sad feelings as well, since the war- with daily reports of injuries and deaths- kept going, and even expanding. What did your school say after the case was over? 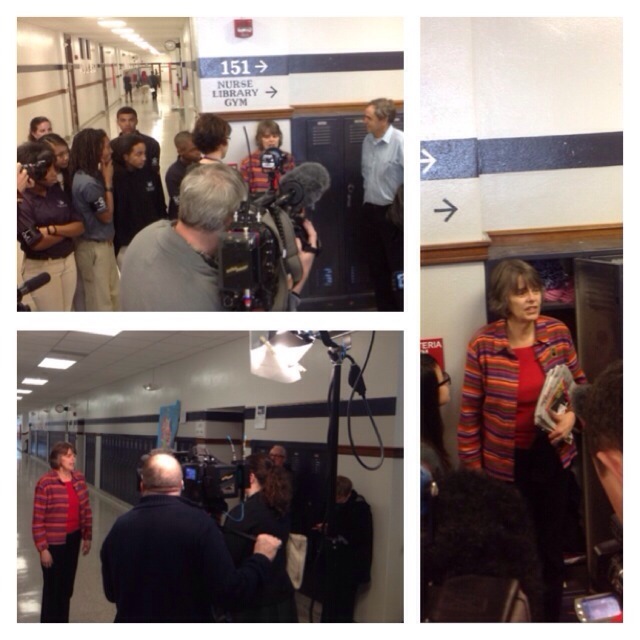 Not formally, but we have enjoyed a warm welcome in the Des Moines schools since. At Roosevelt HS, where Chris Eckhardt’s and several of the other students who wore armbands attended, they invited our attorney, Dan Johnston, to speak at graduation after we won the case in 1969. Have you been back to your school since you won the case? John, Chris, and I spoke at Roosevelt HS in 1992. We were joined by our ACLU attorney, Dan Johnston, the greatest attorney that kids standing up for their rights could ever hope for. People at Roosevelt that year were very kind and welcoming. The week before, Roosevelt students had worn armbands to protest the beating of Rodney King in L.A.
Then, I also returned to Harding recently, in 2013 when John and I were honored to be invited back to speak with students. We were very honored to be given an honorary locker, which we named a “First Amendment locker, ” filling it with Constitutions, armbands and student newspapers that we had collected from student journalists around the country. What was the effect of the Supreme Court’s ruling in “Tinker”? I have learned from teachers, administrators and lawyers who I have spoken with since the ruling that the case had an enormous effect on the climate in schools throughout the country. When the Court ruled that school administrators would no longer have the final decision on which opinions could be heard in schools, students- and teachers – felt more powerful. The court reminded administrators that there was a higher power that they had to answer to: the Constitution. Before that, many administrators thought they had the final say about every decision in their school. The ruling reinforces the idea that students are people with real opinions to be respected. To me, that is important because children and teens have a lot of good ideas that the country and the world could benefit from. What is the limit for student speech in school? At times that is clear, but not usually. 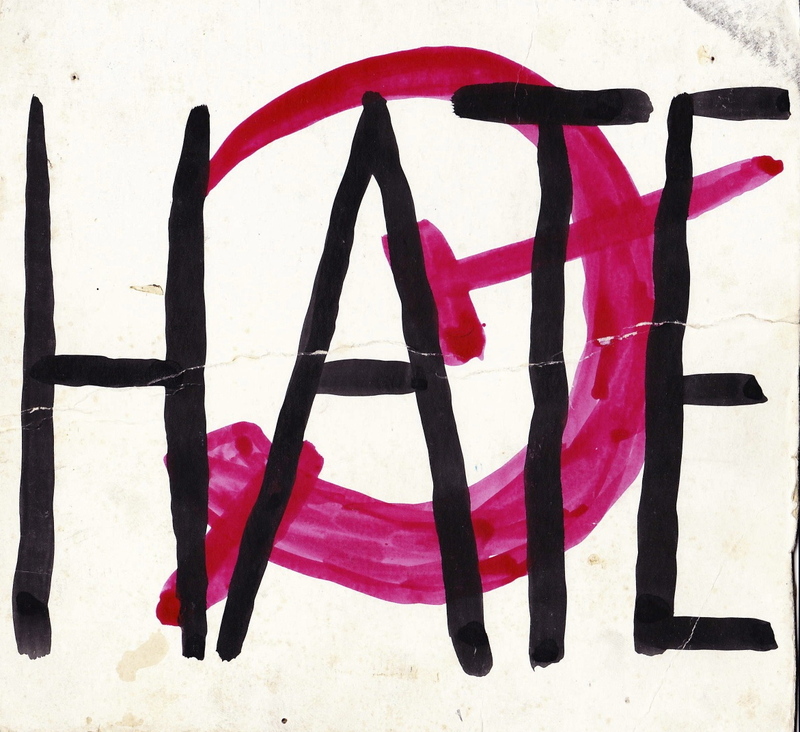 Each situation depends on an interpretation of what is “disruptive” or might be, what “impinges on the rights of others” or might, what is “obscene” or might be, and what promotes “illegal activity.” Increased interest in limiting hate speech, along with the explosion of social media speech makes things even more complicated. It has been increasingly held by courts that speech outside school, if it has a “disruptive” effect on school, is not protected by the “Tinker” ruling. For student journalists, it also depends on the state that you live in, and whether you have designated your program as a “public forum.” Ten states and Washington DC now have laws that protect student journalists from the “Hazelwood” ruling- AR, CA, CO, IA, IL, KS, MA, MD, ND, PA. Check out the NEW VOICES movement, where students in other states are introducing legislation to protect their state’s student journalists as well. The “Tinker” ruling limits school speech protection to speech that does not 1) substantially disrupt school and 2) does not impinge on the rights of others. That leaves a lot of grey area, and there have also been three Supreme Court student speech cases since “Tinker” that cut back on the rights of students: Bethel vs Fraser (1986), Hazelwood v Kuhlmeier (1988), and Morse v Frederick (2007). All four of these Supreme Court cases were ACLU cases. Courts are increasingly ruling that even the prediction of substantial disruption is enough to censor speech (Dariano v Morgan Hill) and that off- campus is also fair game for censorship (that was the case in the Morse v Frederick case, which created a new “school-sanctioned” space, and in a recent 5th Circuit case, Bell v Itawamba, among others. As a result of your case, do students have freedom of speech in school? The Tinker case definitely improved free speech rights of students. But there is a lot of variation, depending on the school. For one thing, wealthier schools allow more free speech. Their students don’t face the restrictions that poorer schools do, like metal detectors and strict uniform policies. Poor schools usually don’t have journalism, either, or student newspapers, so that restricts their speech as well. Sometimes, they don’t have student councils, either. How has the case affected your life? It had a huge effect because I learned at an early age to speak up, and I started to see things in terms of rights, especially kids‘ rights. As a pediatric nurse, I took care of so many kids who didn’t have rights. There were kids who had been burned in house fires that were caused by landlords who didn’t keep their rental property up to city code requirements, or kids who had asthma caused by pollution. So, I saw these things in terms of kids’ rights being violated. I started to realize that most kids live under conditions they have no say about. They go to schools that are usually underfunded, in a society that does make the well being of kids a high priority. I had to encourage kids to stand up for themselves, so I starting using our case as an example. Doing that, I found many other examples of young people standing up in history and also today. Winning this case also made me realize that you never know who will have the “last word.” For example, the Southern Baptist Church apologized for their support of slavery, the Pope and others apologized for their role in the Nazi holocaust, and we have seen the U.S. government apologize to the American Indians. So, I am less influenced by what may be the popular choice because I know that popular choices often don’t stand the test of history. Mostly, I’ve found that it’s a good way of life to know and use your rights. And, the case made me a life-long advocate for the rights of young people- not only young people in the U.S., but kids all over the world. It’s interesting, meaningful, and you meet great people. Sometimes, it’s even fun! Why do you think it is important for youth to be politically active? 1) When youth are politically active, they gain power. In our society, power is what enables populations to make gains in their status and well-being. For youth, that could mean decreased poverty (now highest among children and teens), a healthier planet for kids to live in and inherit, better housing, better education, peace, – conditions where children and youth can thrive. 2) It’s better for everyone when youth are politically active because youth have exceptional creativity, imagination, humanity, and energy. When youth don’t have input, the whole society is cheated. I believe that a time of equality, democracy and harmony that works a lot better for a lot more people is possible. Through political activism, youth will help get us there. How can students take a stand on issues today? Anyway, there are lots of things you can do. And the good news? It’s a good way of life! What else do you want people to know about your experience? That a life spent speaking up for peace, justice and equality is a life well spent. We’re linked through history to so many others who have done that, and I like to learn and read about all of them. So many people are speaking up today for different things, and so many of them are children or teenagers, so I like to learn about them, and tell others as well. We can have a better world, but we have to speak up and make it happen. Things DO change! Are you still an advocate for First Amendment rights? Are you still an advocate for students’ rights? Definitely! And, now is a time when students really need to stand up for your rights, so I’m glad to encourage that, and help in any way I can. What do you hope to accomplish with the Tinker Tour? To encourage students to know their rights, and use them. And, to encourage civics education. We also wanted to hear how students are using their rights today, and so many are. Are you still in contact with the other students involved with the case? Just Ross Peterson, who is an activist in Canada, and my siblings. I’ve recently been in touch with Bruce Clark, who will join us in December, 2015 for our 50th anniversary of wearing the armbands. He’s the president of Iowa Postal Workers Union. I wish I could meet Chris Singer one of these days. If you know how I can reach her, let me know! If you had the chance to do it all over again, would you do it? Yes! And, I do (sort of) have the chance to do it over again, because almost every day there’s something to speak up and stand up about. So, it keeps going on. How can I get in touch with John? Also, check out his website, schema-root.org. It’s full of lots of information on the “Tinker” case! Sadly, Chris Eckhardt, a man with a big heart and great integrity, died in 2012.